What is sustainability? Much has been said about the terms ‘sustainability’ and ‘sustainable development’ over the last few decades, but they have become buried under academic jargon. 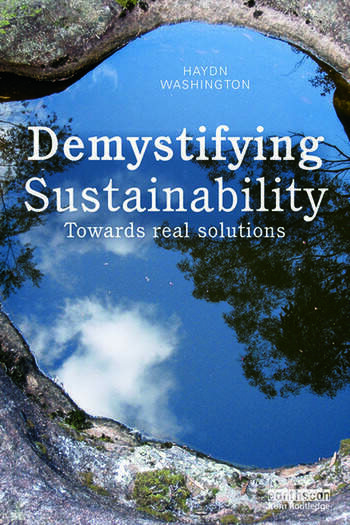 This book is one of the first that aims to demystify sustainability so that the layperson can understand the key issues, questions and values involved. Accessible and engaging, the book examines the ‘old’ sustainability of the past and looks to the future, considering how economic, ecological and social sustainability should be defined if we are to solve the entwined environmental, economic and social crises. It considers if meaningful sustainability is the same as a ‘sustainable development’ based on endless growth, examining the difficult but central issues of overpopulation and overconsumption that drive unsustainability. The book also explores the central role played by society’s worldview and ethics, along with humanity’s most dangerous characteristic – denial. Finally, it looks to the future, discussing the ‘appropriate’ technology needed for sustainability, and suggesting nine key solutions. This book provides a much-needed comprehensive discussion of what sustainability means for students, policy makers and all those interested in a sustainable future. Haydn Washington is an environmental scientist and writer of 40 years’ experience. He is a Visiting Fellow at the Institute of Environmental Studies at the University of New South Wales, Australia.